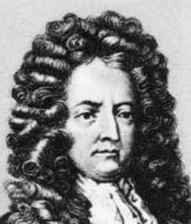 Daniel Defoe was born as the son of Alice and James Foe. His father was a city tradesman and member of the Butchers’ Company. James Foe's stubborn Puritanism (the Foes were Dissenters - Protestants who did not belong to the Anglican Church) comes through occasionally in Defoe's writing. He studied at Charles Morton's Academy, London. Although his Nonconformist father intended him for the ministry, Defoe plunged into politics and trade, traveling extensively in Europe. Throughout his life, Defoe also wrote about mercantile projects, but his business ventures failed and left him with large debts, amounting to over seventeen thousand pounds. This burden shadowed the remainder of his life, which he once summoned: "In the School of Affliction I have learnt more Philosophy than at the Academy, and more Divinity than from the Pulpit: In Prison I have learnt to know that Liberty does not consist in open Doors, and the free Egress and Regress of Locomotion. I have seen the rough side of the World as well as the smooth, and have in less than half a Year tasted the difference between the Closet of a King, and the Dungeon of Newgate." In the early 1680’s Defoe was a commission merchant in Cornhill, but went bankrupt in 1691. In 1684 he married Mary Tuffley; they had two sons and five daughters. Defoe was involved in Monmouth rebellion in 1685 against James II. While hiding as a fugitive in a churchyard after the rebellion was put down, he noticed the name ‘Robinson Crusoe’ carved on a stone and later gave the name to his famous hero. Defoe became a supporter of William, joining his army in 1688, and gaining a mercenary reputation because of a change of allegiance. From 1695 to 1699 he was an accountant to the commissioners of the glass duty and then associated with a brick and tile works in Tilbury. The business failed in 1703. In 1702 Defoe wrote his famous pamphlet The Shortest-Way with the Dissenters. Himself a Dissenter, Defoe mimicked the bloodthirsty rhetoric of High Anglican Tories and pretended to argue for the extermination of all Dissenters. Nobody was amused. Defoe was arrested in May 1703, but released in return for services as a pamphleteer and intelligence agent to Robert Harley, 1st Earl of Oxford, and the Tories. While in prison Defoe wrote a mock ode, Hymn to the Pillory (1703). The poem was sold in the streets; the audience drank to his health while he stood in the pillory and read aloud his verses. And as they change are virtues made of crimes." When the Tories fell from power, Defoe continued to carry out intelligence work for the Whig government. In his own days Defoe was regarded as an unscrupulous, diabolical journalist. Defoe used a number of pen names, including ‘Eye Witness,’ ‘T.Taylor,’ and ‘Andrew Morton, Merchant.’ His most unusual pen name was 'Heliostrapolis, secretary to the Emperor of the Moon,' used on his political satire The Consolidator, or Memoirs of Sundry Transactions from the World in the Moon (1705). His political writings were widely read and made him powerful enemies. His most remarkable achievement during Queen Anne's reign was the periodical A Review of the Affairs of France, and of All Europe (1704-1713). It was first published weekly, then three times a week. From 1716 to 1720 Defoe edited Mercurius Politicus, then the Manufacturer (1720), and the Director (1720-21). He was contributor from 1715 to periodicals published by Nathaniel Mist. Defoe was one of the first to write stories about believable characters in realistic situations using simple prose. He achieved literary immortality when, in April 1719, he published Robinson Crusoe, which was based partly on the memoirs of voyagers and castaways, such as Alexander Selkirk, who spent four years and four months on his island. The first edition was printed in London by a publisher of popular books, W. Taylor. No author's name was given. William Selkirk was the son of a Scottish tanner, who became the master of the Cinque Ports Galley, a privateering ship. Selkirk went to sea in 1704 under William Dampier and was put ashore at his own request - or, according to some sources, as a punishment of insubordination - on the island of Juan Fernandez in the Pacific, hundreds of miles off the coast of Chile. The island was uninhabited, and he survived there until his rescue in 1709 by Captain Woodes Rogers. Selkirk claimed that he had become a "better Christian" and it was a positive experience. As a journalist Defoe must have heard his story and possibly interviewed him. Selkirk never did go back to the Pacific island, as Defoe had Crusoe do in two sequels. Selkirk became known as an eccentric. Robinson Crusoe is a mariner - actually an arrogant slave trader - who runs away to the sea at the age of nineteen despite parental warnings. He suffers a number of misfortunes at the hands of Barbary pirates and the elements. Finally Crusoe is shipwrecked off South America. By salvaging things he needs from the ship, including the Bible, Crusoe manages to survive in the island. "The Country appear'd so fresh," he writes in his journal, "so green, so flourishing, every thing being in a constant Verdure, or Flourish of Spring, that it looked like a planted garden." He stays in the island twenty-eight years, two months, and nineteen days. Aided with his enterprising behavior, Crusoe adapts into his alien environment. After several lone years he sees a strange footprint in the sand. Savages arrive for a cannibal feast, and one of their prisoners manages to escape. Crusoe later meets the frightened native, christens him ‘Man Friday,’ and teaches him English. Later an English ship arrives. Crusoe rescues the captain and crew from the hands of mutineers and returns to England. Robinson marries and promises before end of the novel to describe his adventures in Africa and China. Sequels to the story, The Farther Adventures of Robinson Crusoe (1719), in which Crusoe revisits the island and loses Friday in an attack by savages, and The Serious Reflections of Robinson Crusoe (1729), did not gain wide recognition. Defoe had troubles at first finding a publisher for the book and eventually received £10 for the manuscript. Employing a first-person narrator and apparently genuine journal entries, Defoe created a realistic frame for the novel, which distinguished it from its predecessors. The account of a shipwrecked sailor was a comment both on the human need for society and the equally powerful impulse for solitude, but it also offered a dream of building a private kingdom, a self-made Utopia, and becoming completely self-sufficient. By giving a vivid reality to a theme with large mythic implications, the story have since fascinated generations of readers as well as authors like Joachim Heinrich Campen, Jules Verne, R.L. Stevenson, Johann Wyss (Der schweizerische Robinson), Michael Tournier (Vendredi ou les limbes du Pacifique), J.M. Coetzee (Foe), and other creators of Robinson-esque stories. During his remaining years, Defoe concentrated on books rather than pamphlets. At the age of sixty-two he published Moll Flanders, A Journal of the Plague Year, and Colonel Jack. His last great work of fiction, Roxana, appeared in 1724. Defoe's choice of a female protagonist in Moll Flanders reflected his interest in the female experience. Moll is born in Newgate, where her mother is under sentence of death for theft. Her sentence is commuted to transportation to Virginia. The abandoned child is educated by a gentlewoman. Moll suffers romantic disillusionment, when she is ruined at the hands of a cynical male seducer. She becomes a whore and a thief, but finally she gains the status of a gentlewoman through the spoils of a successful colonial plantation. After being close to the Whigs, Defoe moved back to the Tories. In the 1720’s Defoe had ceased to be politically controversial in his writings, and he produced several historical works, a guide book A Tour Through the Whole Island of Great Britain (1724-27, 3 vols. ), The Great Law of Subordination Considered (1724), an examination of the treatment of servants, and The Complete English Tradesman (1726). Defoe's father had stayed with his older brother, Henry, in London during the Plague Year of 1665, and their experiences possibly provided material for A Journal of the Plague Year (1722). Defoe himself was about five years old at the time. The narrator has the same initials, H.F., as Henry Foe. For his account, Defoe also used printed records. Phenomenally industrious, Defoe produced in his last years works involving the supernatural, The Political History of the Devil (1726) and An Essay on the History and Reality of Apparitions (1727). He died on 26 April, 1731, at his lodgings in Ropemaker's Alley, Moorfields. One of the most complete bibliographies of Defoe's works lists almost 400 titles, ranging from pamphlets to books on the occult and novels. Moll Flanders, the daughter of a woman who was hanged for thievery, marries several times (including her brother), is sent to prison, and finally redeemed by a priest who sends her to America. Sequel to "The Adventures of Robinson Crusoe." Crusoe leaves for Africa and becomes the only survivor of a shipwreck. On the island, after finding human footprints and a man called Friday, the two encounter cannibals and try to find a way to escape the island.